Design and manufacture of automatic assembly machines for aluminum Pilfer-Proof type capsules and similar, plastic products for complex closing mechanisms in the food, pharmaceutical, cosmetics and household products. IPACK-IMA, International Exhibition of Packaging and Packing. INTERPACK 2017 - Dusseldorf exhibit. We was present at the International exhibition of machinery and packaging products and machines for the confectionery industry. 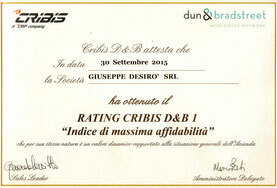 The Giuseppe Desirò Srl was awarded with "Rating 1, highly reliable" index from D&B, CRIF, a specialist in credit information systems and decision support, and D&B, the world leader in the business information sector with over 168 years of experience.